The new maps are part of the STATEMAP Program. OGS scientists publish Preliminary Soil Amplification Map of Oklahoma According to the National Earthquake Hazard Reduction Program (NEHRP). Scale 1:500,000. At 6:15 PM, local time, on February 28, 2019 a Magnitude 3.4 earthquake occurred northeast of Edmond, OK, with reports of mild shaking in Edmond and light shaking in Oklahoma City. There are no reports of damage at this time. The earthquake occurred adjacent to a mapped fault that has had seismicity in the last several years. The M3.4 earthquake was preceded by a M2.3 earthquake at 3:58 PM on February 28 and at least one aftershock has since occurred, a M2.4 at 12:21 AM March 1. There remains a high likelihood of aftershocks for the next several days. Whereas most aftershocks are smaller than the mainshock, a very small fraction of earthquakes are followed by a larger earthquake and the seismic hazard remains high in the area. We will continue to monitor the seismicity and provide assistance to the Oklahoma Corporation Commission (OCC), other state agencies, and the public. The Oklahoma Geological Survey (OGS) is a state agency and a research organization of the University of Oklahoma. OGS monitors seismicity throughout the state; an effort that began with the Leonard Geophysical Observatory starting in the 1970s and continues today in Norman. Today, the seismic network encompasses 100+ seismometers that deliver real-time data to the central data hub in Norman. Analysts in Norman process the seismic data and deliver updated earthquake locations, magnitudes, and other scientific data products that are freely-available and shared through the OGS website (http://ogs.ou.edu/) and through collaborative partners at the United States Geological Survey. Last September, the Oklahoma Geological Survey hosted a workshop focusing on the Sooner Trend Anadarko Basin Canadian and Kingfisher Counties (STACK) Play in Oklahoma. The play was discovered in 2011, and has quickly become one of the hottest resource plays in North America. Despite extensive drilling activity in this play, understanding of the petroleum geology of the area is limited. The workshop spanned two days, beginning with a day-long technical workshop held at the Moore-Norman Technology Center, which was attended by over 200 people. The following day, two half-day workshops focusing on core were held at the OGS’s Oklahoma Petroleum Information Center (OPIC) in Norman. Each core workshop was attended by around 40 people. The main objective of the technical workshop was to learn from researchers and operators in the STACK Play, with an emphasis on the Meramec Lime and Woodford Shale. The core workshops presented core from several key wells of the Meramec and Woodford Shale in Blaine, Kingfisher, and Canadian Counties. David Brown, OGS Associate Director, said that the OGS was uniquely suited for hosting this workshop. To read more about the STACK Play workshop, see the most recent issue of the Oklahoma Geology Notes. Eleven educators participated in a two-day workshop hosted by the Oklahoma Geological Survey. 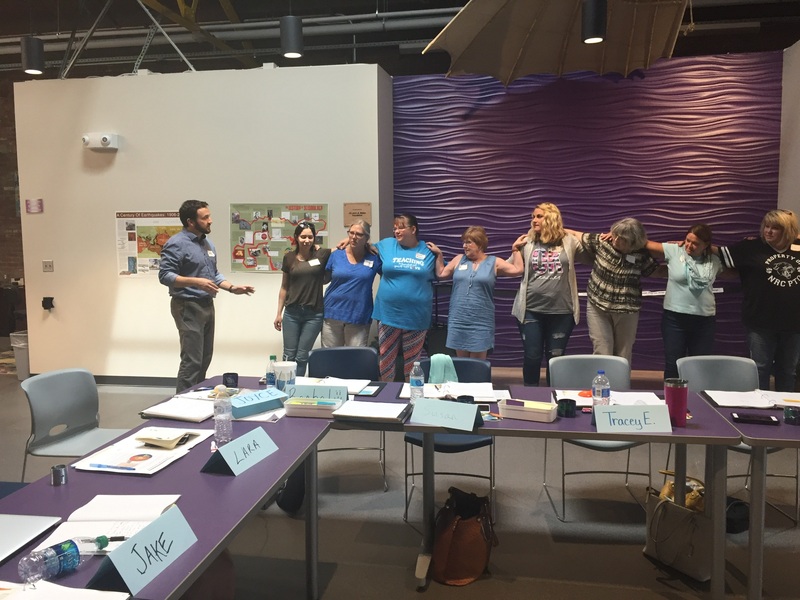 The educators are part of a project called BLOSSM in Oklahoma. BLOSSM (Bridging Local Outreach & Seismic Signal Monitoring) aims to place a total of 100 personal seismographs (Raspberry Shakes) into educational institutions in Oklahoma, including schools, libraries, and museums. During the first day of the two-day workshop, teachers and librarians received a Raspberry Shake, learned how to install it in their educational facility, and experimented with the type of data it collects. During the second day of the workshop, participants explored introductory seismology and Earth science concepts with the help of State Seismologist, Dr. Jake Walter, his undergraduate student, Sarah Sundberg, and Education & Outreach Coordinator, Dr. Molly Yunker. Participants concluded the workshop with numerous resources including lesson plans, ideas for classroom activities, a working seismograph, seismology posters, and other teaching tools to aid in STEM education next fall and beyond. 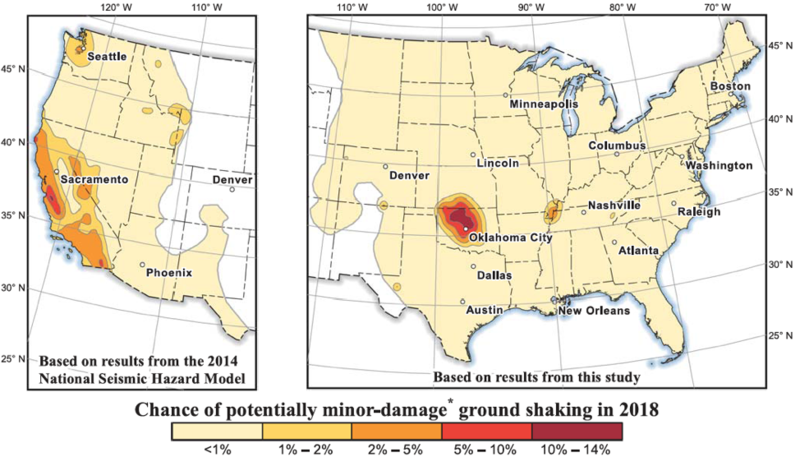 The U.S. Geological Survey has released updated maps identifying potential ground-shaking hazards. The report shows continuing elevated risk of damage in Oklahoma, with some expansion of the area of greatest concern. The expanded area is in part due to slight increases in seismicity in areas that have experienced very few earthquakes previously. The results are significantly dependent upon algorithms used to distinguish main events from aftershocks, which may be different for induced than for natural earthquakes. Earthquake frequency has declined by more than three quarters from the peak in 2015-2016. The Oklahoma Geological Survey, the Oklahoma Corporation Commission, industry and university scientists, are collaborating together to further reduce seismic activity in Oklahoma. Seismological Research Letters, an internationally recognized peer-reviewed journal, is dedicating a special issue to scientific studies related to the 5.8 magnitude earthquake that struck near Pawnee last September — the largest recorded seismic event in Oklahoma history. 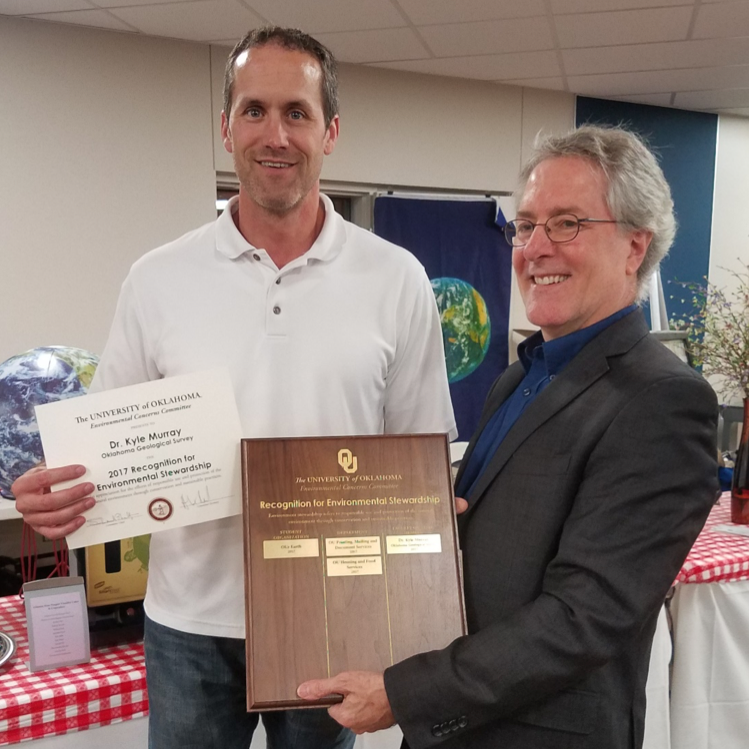 On April 20, 2017, Dr. Kyle E. Murray of the Oklahoma Geological Survey (OGS) was presented a "Recognition for Environmental Stewardship" Award from the University of Oklahoma Environmental Concerns Committee (http://www.ou.edu/admin/ecc/) in appreciation of his efforts in responsible use and protection of the environment through conservation and sustainable practices. The mission of the Environmental Concerns Committee is to "advise the president of the university concerning environmental issues and to promote awareness of energy and other resources conservation, recycling, and personal and environmental well-being and safety." 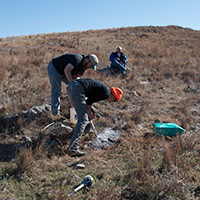 Discover the experiences of OGS Geologist Stacey Evans as she investigates fluid flow and paleomagnetism to investigate the Arbuckle Group and the basement rocks in Oklahoma in the latest entry in the Oklahoma Geological Survey's Field Blog.